Let the smartypants in your life show off their love of all things geek chic with these calculating cufflinks. Created by self-confessed nerd, Tiffany Ard, each handmade, sterling silver cufflink is stamped with a discreet mathematical symbol: Pi, Percent, Sigma, or Not Equal To. Sold individually to allow each wearer to build their own, unique style equation. Click here to view information about our jewelry bags. By junior high, Tiffany Ard was a self-identified nerd. "I was too afraid of being hit by a ball to do sports, too shy to be a theater kid, too unpopular to be one of the popular kids," says the illustrator and science enthusiast. "The kids I spent time with liked writing stories and inventing languages and pretending to be time travelers." When she had a child of her own, Tiffany realized there were plenty of toys designed to make tots smart and successful—but dorky for the sheer fun of it? Not so much. Her Nerdy Baby line fills the (cosmic) void. "The best gifts invite open-ended play and make kids feel empowered to experiment fearlessly," she notes. "If they happen to learn some fun science facts, all the better." Order each $40 cufflink separately, cufflinks are $80 per pair. Sold individually to allow each wearer to build their own, unique style equation. Surprised to get this as just ONE cuff link. I thought this was a pair. It was very unclear and hugely disappointing as the price does not justify the product. Who wants one cuff link --strange marketing. Other wise the link is very nice. I bought two of the pi cufflinks for my fiance (make sure to buy two to get a pair). He thought they were both unusual and stylish, and has already worn them. The finish is very nice and the cufflinks are a good size. I don't like how u can just buy pairs. Perfect for Sigma Pi fraternity! Definitely read the print underneath. These cuff links are so individually so be sure to buy two at the same time. I like that they also don't have to match. Delivery was very good and was happy with that service. The only thing that annoyed me was that I asked for an engraving (since its apparently for free) and my cuffs did not get delivered with the engraving but short of that it's a really great gift! I would definitely recommend this product! when I got one cufflink I called customer service and they said must be a mistake! Me too! they said it would take 10 days to send the other one. Here I am on Christmas Eve figuring out they are actually selling ONE cuff link for [$]. Biggest rip off since Enron...certainly not worth[$]a pair. My son LOVED his PI cufflinks stating they were "AWESOME." I rarely buy gifts he likes so this was a great decision. Found the cuff link through your catalog...Service was great as I was unaware a cuff link was sold individually (although listed that way in the catalog) and your service rep kindly arranged for the other cuff link to be shipped so my son could have two cuff links. I missed the fine print...that these cuff links are sold ONE AT A TIME. For [$], I certainly expected a PAIR. But they are sold individually so that different symbols can be mixed and matched. When I called Customer Service, thinking there had been a mistake, I realized I had to either return the link or order a second. I ordered a second. I was surprised I was charged shipping and asked for that to be waived. The catalog description actually did mention that the links are sold individually, but I think it could have been made more obvious. I normally would not have paid $80 for a pair of cufflinks, but oh well...they are nice and look exactly as they do in the catolog. This was confusing. Purchased as gift and recipient only got one. I did not realize I needed to order two. Luckily, recipient let me know that he has two arms! Made 3 phone calls to customer service before someone realized why this happened - I needed to order two! I get it now - you can mix these symbols - so perhaps I was not completely aware of the concept. This is a really cool product, I just wish I had read the (small, italisized, in a completely separate area from the place where you click to buy) fine print where it says you are getting ONE cufflink. I think if you are going to sell cufflinks individually, you need to write it in big bold type in the product name or make it in red or something. No one sells cufflinks individually and even though they did put that somewhere in there, I don't think it's made clear enough. I didn't read the entire page before buying it and it's as unusual as selling one sock or one glove, so it really ought to be in big, red type across the page. Other than the fact that I will have to pay to have another one shipped out and hope it gets here in time for Christmas, I'm happy with the product. 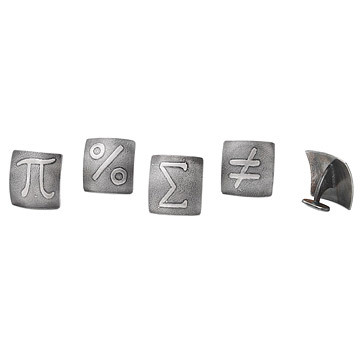 Let the smartypants in your life show off their love of all things geek chic with these Math Symbol Cufflinks.